Toyota Motorsport GmbH (TMG) has revealed further details of its plan to make Nürburgring history on 29 August by setting a new electric vehicle (EV) lap record on the demanding 20.832km Nordschleife. TMG’s high-performance electric powertrain will power the car as it aims to significantly improve on the current lap EV record of 9min 1.338secs. Based on unofficial testing and depending on weather conditions, TMG expects to hit lap-record pace immediately, with additional days scheduled as back-up. The TMG electric powertrain uses two electric motors to deliver peak power of 280kW and a top speed of 260km/h with zero emissions. 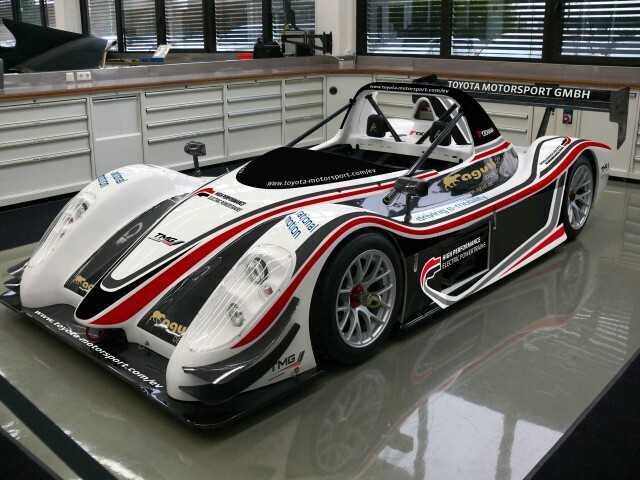 That makes it ideal to power any future single-make electric motorsport series and TMG will begin commercial sales of its electric powertrain technology in 2012. Total weight of the two-seater sports car is just 970kg, including the lithium-ceramic battery which allows for nimble handling around the demanding Nordschleife, essential for setting a competitive lap record. TMG today revealed the first images of its electric vehicle, with a modern, dynamic livery from Aguti which captures a sense of electrifying speed. TMG is also proud to announce its partners in this lap record attempt, all of whom enjoy visible branding on the electric vehicle. Aguti created and implemented the livery concept while rational motion integrated the electric powertrain, traction battery and control strategies. EVO Electric motor technology delivers the power and Yokohama is the tyre supplier. Official timers will be present to authenticate the lap record while video and a photography crew will record a milestone achievement in EV development. These materials will be made available to all media immediately after any successful record attempts. Partner Profile - Aguti: Aguti began in 1992 as a design house specialising in the development and sale of automotive seats. In 1995, the company expanded its range of products and established itself as a systems supplier providing customers with a complete package deal from conception through to production, sales and marketing. Seat technology remains the main focus of the Aguti company and seating is developed for various vehicles, such as motorhomes, coaches and emergency vehicles. Located in Langenargen am Bodensee, Aguti continues to increase its turnover and add to its portfolio of innovative designs with ventures in yacht and other transportation design. For several years Aguti has cooperated with TMG on design projects, including wheel rims, body parts and graphics. Partner Profile - rational motion: Founded in December 2009, rational motion GmbH are specialists offering turnkey development solutions and system integration in the field of alternative fully-electric and hybrid powertrain systems. Services provided by the Cologne-based designers and engineers range from conception to prototype and near-series development through to design reviews, with in-house implementation of all components and processes, on both the hardware and software level. With its roots in the Formula 1 development environment and having accumulated years of expertise and experience, the design team has a proven record of bringing forth excellence in even the most competitive and at the same time most advanced areas of application for automotive vehicle integration.